MSPs will be asked to formally refuse to give Holyrood's consent to the EU Withdrawal Bill on Tuesday. The Scottish and UK governments are at odds over provisions of the Brexit legislation on what happens to devolved powers after the UK leaves the EU. Scottish ministers have put forward a motion for debate on Tuesday, asking MSPs not to give consent to the bill. It is expected this will pass, with Labour, Greens and Lib Dems backing the SNP in opposing parts of the bill. UK ministers have refused to say if they would go ahead and legislate without Holyrood's consent, saying there is still a chance to come to an agreement. First Minister Nicola Sturgeon told business leaders in London on Monday that "time is running out" for a deal to be done. The row centres on how devolved powers currently exercised from Brussels are used after Brexit. The Scottish and UK governments agree that some should be used in UK-wide "frameworks" of powers, creating joint rules and regulations across the UK, but their views differ on how these should be set up and run. Scottish ministers want Holyrood's express consent to be sought for the use of these powers, while UK ministers argue that this could give the devolved parliaments a "veto" over UK-wide structures. A long-running series of talks has failed to produce a deal between the two sides, although UK ministers were able to strike an agreement with counterparts in Wales. Welsh parliamentarians will consider a consent motion of their own on Tuesday. Scottish ministers say they could instead rely on their own alternative Brexit legislation, which was passed by MSPs but has been challenged in the Supreme Court by UK law officers. 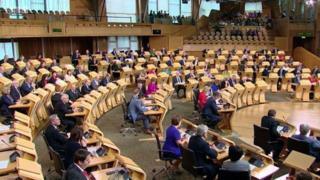 The motion put forward by Scottish Brexit minister Mike Russell said that part of the Westminster bill would "constrain the legislative and executive competence of the Scottish Parliament and the Scottish government". Mr Russell said MSPs had "a powerful opportunity to unite to protect the powers of devolution". The Conservatives have put forward an amendment proposing the parliament consent to the bill, while Labour tabled one calling for "cross-party talks in an attempt to broker an agreed way forward". Holyrood's constitution committee has also published a report recommending that if a political solution to the row cannot be found, MSPs should refuse consent for the contentious sections of the Withdrawal Bill. The committee said the differences between the Scottish and UK governments "could be resolved through an emphasis on mutual trust and respect", but that if this cannot be achieved then MSPs should not consent to the section of the bill on devolved powers. SNP, Labour and Green members backed this position, while Conservative committee members voted against it.